Growing up, I loved The Sisterhood of the Traveling Pants series, and when I saw this book for review on NetGalley, I instantly decided to pick it up. While the synopsis said it was a science fiction/time travel novel, my head was thinking SISTERHOOD OF THE TIME TRAVELING PANTS. While I was exceedingly mistaken, I was generally still pleased. (We all know I am a sucker for time travel.) I received this book for free from the publisher in exchange for an honest review. This does not affect my opinion of the book or the content of my review. 1. The writing isn’t the type that will blow you away. There were many passages that I found super dull and more telling than showing. When it comes to post-apocalyptic settings, I don’t generally enjoy being “told”. I like seeing how the world plays out, how the characters live and thrive in the world. Sadly, this is not to be seen. While the time travel is adequately explained, it leaves a lot of gaps for the reader to fill. In the future, the world building is rushed, and never naturally done. For the reader, this is a very frustrating thing to encounter. 2. A lot of huff and puff in regards to global warming. Now I don’t know what the author’s stance is on global warming, but the future she creates is a bleak one. There is heavy emphasis on the inevitable evilness of man and how humans are selfish and corrupt. This issue isn’t one that is totally solved either. While I get that teenagers cannot fix the entirety of the world’s problems, Brashares sets it up to seem like they will. I would have enjoyed more of a united emphasis on common good. 3. Warning, anti-climatic scenes ahead. There is a lot of plot driven scenes in this book that kept me swiping my kindle pages like crazy. Brashares does write good suspense, and it did make me want to keep reading. But at the climax of the book it just *ends*. There is little falling action and almost zero resolution. While this can be successfully executed, it was not done so in this book. 4. Show me ONE teen that un-ironically uses the phrase “make love” in real life. Okay, so I feel a little harsh as I write this review, so I will throw out the fact that this is a creative plot. In a genre where time travel is done time and time again (pun intended), this is a story that is fresh and unique. I did enjoy it, don’t get me wrong. I just guess that I expected more from an established author. This isn’t a book I would spend money on. Check it out at the library or borrow it from a friend. If you are a Pants fan, don’t get your hopes up for similar writing. This is completely different. Nevertheless, it may still be worth reading for fans of Brashares and those looking for a fresh sci-fi story. I was hoping to hear that this one was worth reading. I've never read the Pants books, but I did read My Name is Memory and I loved it (and I'm so disappointed there's no sequel). 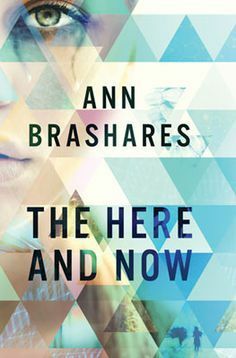 When I heard about The Here and Now, I thought maybe it would be really good, too, since it also deals with a paranormal-ish premise; this one's time travel, while My Name is Memory was reincarnation. I've started this one twice now, and I just can't get into it. It bums me out because I bought a signed copy, and I just want to love it like I loved all of the Sisterhood books.